Free Shipping Included! 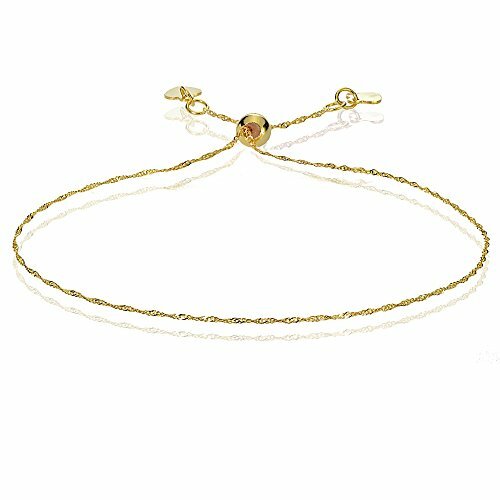 Bria Lou 14k Yellow Gold .9mm Italian Singapore Adjustable Chain Bracelet, 7-9 Inches by Bria Lou at SCRHI. MPN: BL-JBSG14584. Hurry! Limited time offer. Offer valid only while supplies last. This Italian chain bracelet features a singapore twist design in 14k yellow gold, .9mm wide. It showcases an adjustable clasp with dangling hearts. This Italian chain bracelet features a singapore twist design in 14k yellow gold, .9mm wide. It showcases an adjustable clasp with dangling hearts. The bracelet extends up to 9-inches. Ioka Jewelry - 14K Tri Tone Color Figaro 3+1 Butterfly Baby ID Bracelet - 6"
JewelStop 14K Yellow Gold 7.9 mm Rolo Chain Engravable Child Baby ID Heart Bracelet - 6"
CUSTOM ENGRAVED - 14K White Solid Gold Figaro 3+1 Tiny Baby ID Bracelet - 4.5+1"